Melissa and her mom, Susan, had a floral shop in Solana Beach, CA when I met them in ’07. Then Susan retired, and Melissa (with partner Jon Hawley) launched CW Design & Landscaping, specializing in gorgeous in-ground gardens. But container gardens are Melissa’s first love (OK, except for Jon), so this dynamic couple—who also are in Succulents Simplified and Designing with Succulents—spun off Fresh Chic, CW’s boutique and container-garden division. — Picks succulents in scale with their containers. — Repeats plants’ colors and/or forms in her container selections. — Uses lines and shapes of pots to lead the eye and frame the plants. — Plants densely for a lavish look and uses topdressing to conceal the soil. — Sets a container atop a table that becomes part of the composition. — Jazzes up gift arrangements with real bows of satin or velvet. Learn more (from Melissa herself!) in my how-to video about hanging containers. 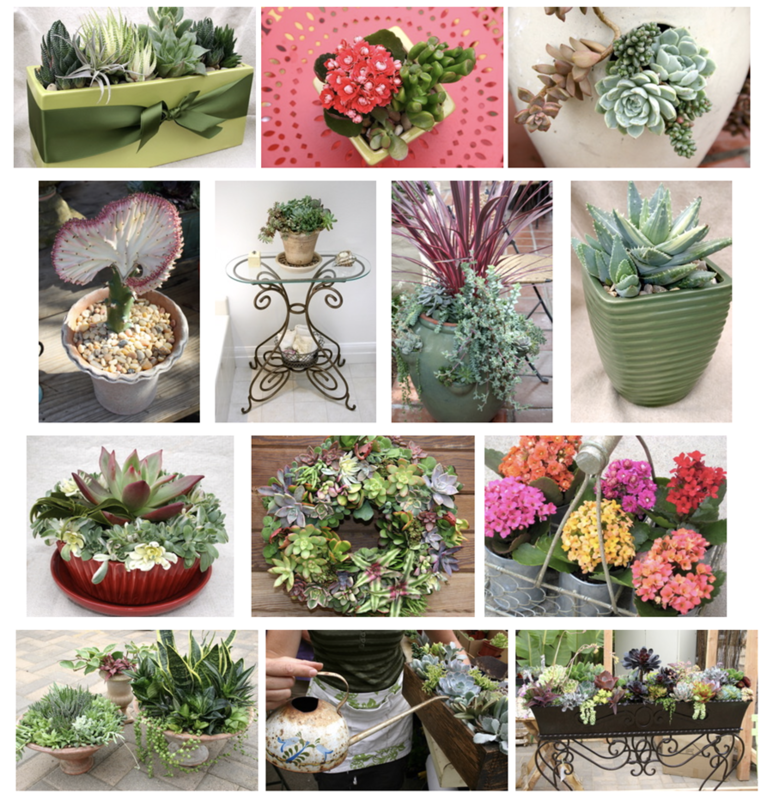 See Fresh Chic’s succulent designs at San Diego’s Spring Home/Garden Show, March 2-4, in the outdoor vendor area. Btw, social media really “likes” Melissa’s innovative, photogenic combos, so have your cell phone handy! Come see me at the Show! I’m giving two new presentations and signing all three of my books, including the new 2nd edition of Designing with Succulents. Fri., March 2 at noon and Sat., March 3 at 11:00, join me in the Bing Crosby exhibit hall in the presenters’ area (southwest corner). Also enjoy display gardens by top designers. The Show’s all about helping you make your home and outdoor living spaces your own private paradise. Don’t pay admission! Come as my guest/s. You’ll still have to pay parking, but my VIP pass for two lets you waltz right in. (Print it out and bring it with you, like you would an airline boarding pass.) Hey! It’s worth $18!